Just Things was opened by Wendy and David Westwood in May 2012 at 26 Silver Street, Ilminster. For nearly 13 years, Wendy helped to run the One World fair trade shop in Hull as a shop volunteer and Company Secretary. David worked on the city’s steering group that helped Hull achieve Fair Trade City status, and on the city’s 2005 bicentenary celebrations of William Wilberforce’s Act of Parliament to abolish the slave trade. 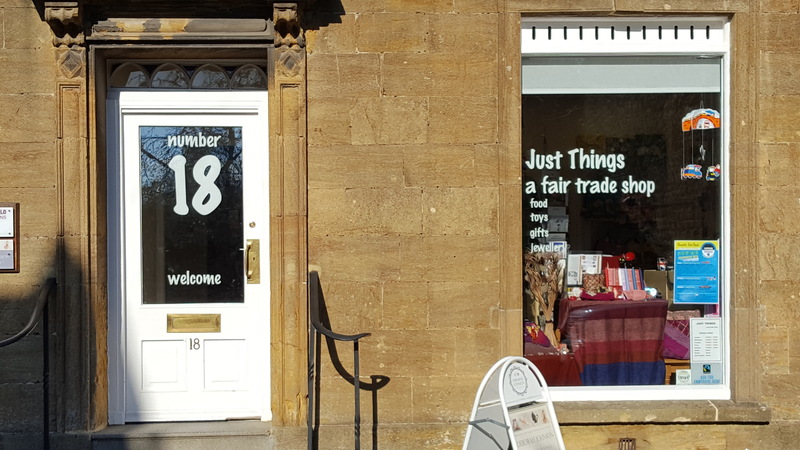 On moving to Somerset, they decided to open a fair trade shop of their own and moved into a vacant shop in Ilminster. After a successful first year, the decision was made to move nearer to the centre of town when a shop became available at 33A Silver Street. After 5 years there, they moved again, and from 2nd October 2018 began trading from 18 Silver Street. In January 2019, Just Things welcomed Leigh-Lin Ning as a new team member. She comes with valuable experience of fairtrade in Wallingford in Oxfordshire.